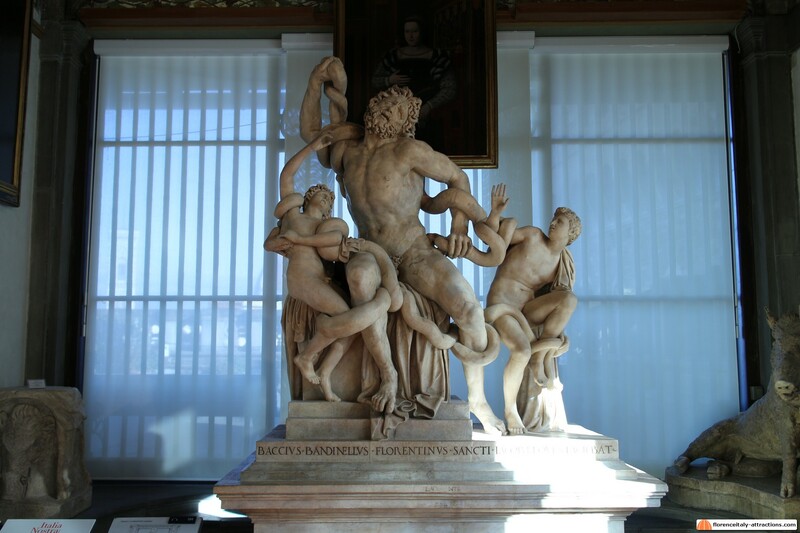 Michelangelo Buonarroti, sculptor, architect, painter and poet, is well known for his preferences: he thought sculpture was a superior art and never gladly accepted any work of painting. If we exclude frescoes and focus on painting on panel, there is only one work we can 100% attribute to the great artist: Michelangelo Doni Tondo. This masterpiece of painting that broke many of the Renaissance rules and introduced a new tendency in painting, later called mannerism, that will ultimately evolve in the baroque style. 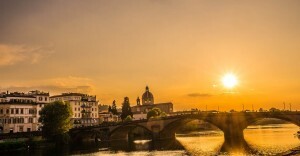 Let’s discover everything about this masterpiece, on display in Florence at the Uffizi Gallery. 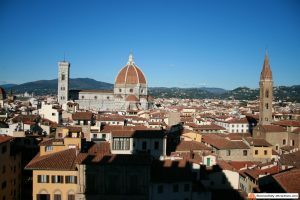 Agnolo Doni was a rich merchant and patron in Florence across the 15th and 16th century. He certainly loved arts and had a great taste, choosing Raphael and Michelangelo as his own personal painters. 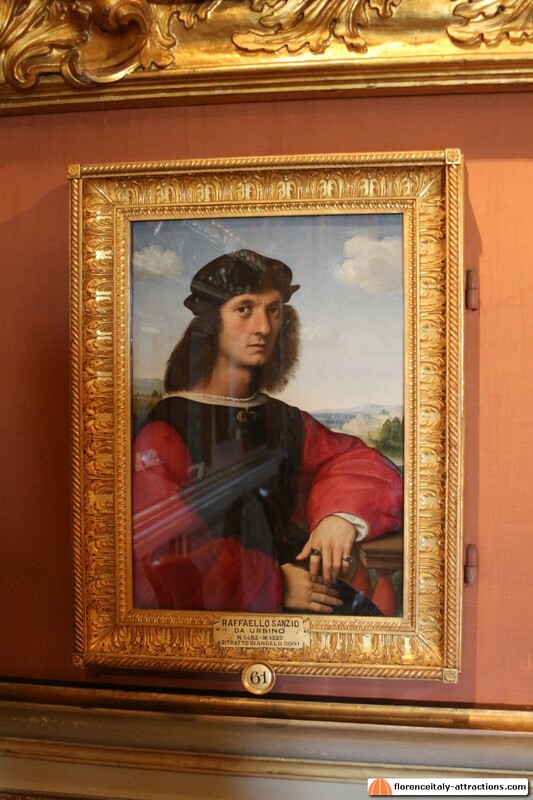 The portraits of Agnolo and his wife Maddalena Strozzi by Raphael are on display in the Pitti Palace. 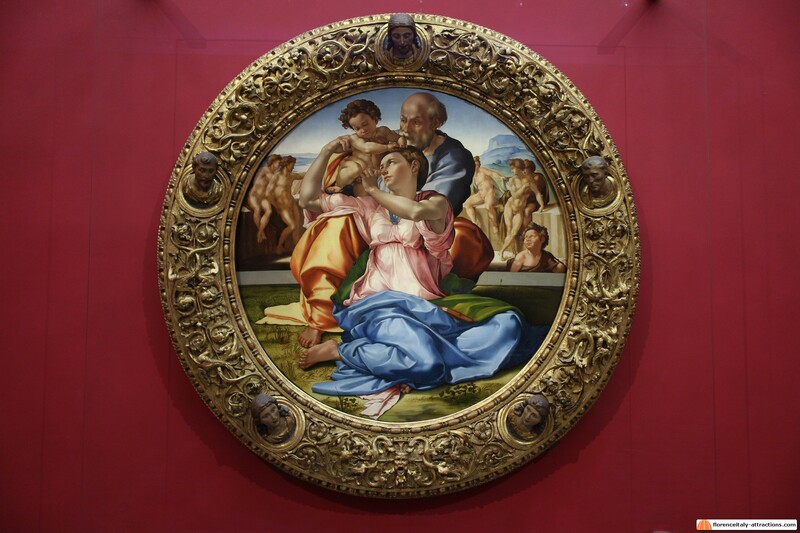 Agnolo Doni commissioned Michelangelo Doni Tondo, most probably to celebrate the birth of his daughter. 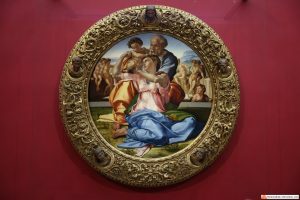 The circular shape of the painting remembers the tradition of the desco da parto, the typical gift for a new mother in Florence. 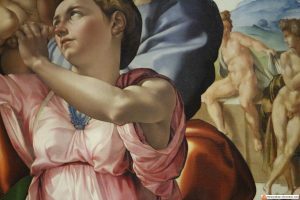 Is there any mother who wouldn’t like to receive a painting by Michelangelo as a gift? The subject of Michelangelo Doni Tondo is the Holy Family: the Virgin Mary, St Joseph and Jesus Christ, in a typical Renaissance representation, like a normal family having a picnic I dare to say. That said, the painting is filled with hidden meanings: behind the Holy Family stand five naked men. They are on the other side of something that looks like a river or a ditch. These men represent the Pagan Age, as opposed to the Christian Age symbolized by the main subject. In the middle, the connection between Pagan and Christian is represented by a child: St John the Baptist, the last prophet of the Old Testament, the first prophet of the New Testament. There is no doubt on where inspiration came from, at least for a part of Michelangelo Doni Tondo. The body to the immediate right of the Holy Family in the picture above has been painted in a strange position, certainly inspired to an ancient statue. 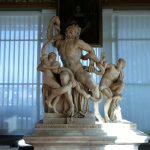 On January 14th, 1506, during an excavation close to the Domus Aurea in Rome, workers made an incredible discovery: a magnificent sculptural group representing Laocoon. Michelangelo was called to be there to see the statue removed from the ground. The wonderful group is on display at the Vatican Museums in Rome, but a copy was made by Baccio Bandinelli for the Medici family collections and can be seen at the Uffizi gallery. How much would you pay for painting by Michelangelo?